Sometimes, our ideas and inspirations get stuck in a rut and need that little push from that special someone, or sometimes we just simply need to get informed on how to advance when we don’t see any solution in front of us. 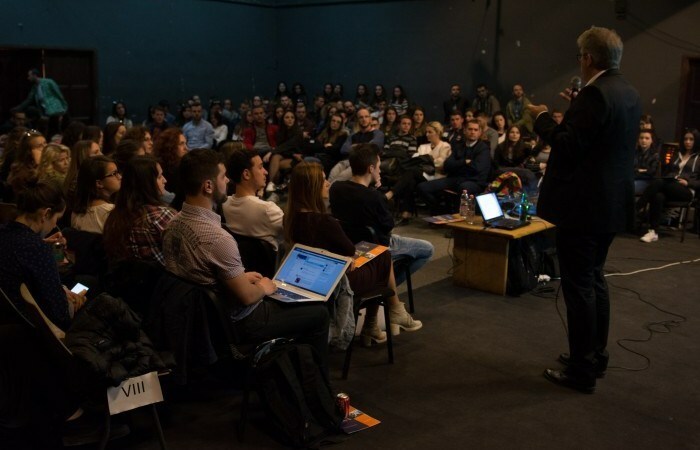 That was the aim of BarCamp Prishtina, the 37th edition, taking place in the warm and welcoming environment of the Oda Theater in Prishtina. With the aim of shining a ray of light in the area of scholarships and support for NGOs, upcoming leaders and students in Kosovo, BarCamp Prishtina #37 gathered some of the most inspirational speakers of their fields in so they could share the opportunities that young people in Kosovo are able to benefit from, whether educationally or in the form of support for their NGO or event. Nora Loxha Sahatçiu, one of the main contributors to the “Salih & Isa Nushi” Foundation, came on stage with a modest presentation of their foundation and how they have had a very humble start, supporting only a handful of students in their beginning and growing the number of support beneficiaries steadily each year. “We try to select our beneficiaries neutrally and to encourage females to apply for help through the foundation, because we want to help create a faith in the system for those who are not as lucky as others”, explained Nora, while also sharing with the audience some of the stories of the Foundation’s beneficiaries. Both tear-jerking and emotional, the history of the foundation and its stories of success had a huge impact on the audience and commanded plentiful applause. Zana Cana, representative of the IPKO Foundation as Program Assistant, had the opportunity to present before the audience what IPKO Foundation has to offer for the youngsters and aspiring digital leaders, going into further detail of how one can apply for the Sponsorship Program offered by the Foundation and some of the criteria and eligibility one must fulfill to be a recipient of the IPKO Foundation support. The event was concluded by Visar Jasiqi, sharing the history of support and the opportunities offered by A.U.K. – R.I.T., and inviting the audience to look into the opportunities awaiting them. Until the next edition of BarCamp, stay informed and don’t hesitate to use the opportunities in your path!